Here comes trouble! 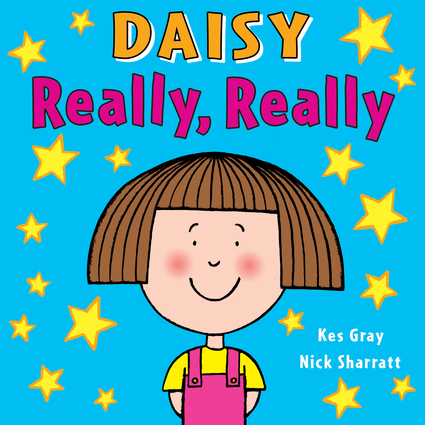 A super-dooper picture book featuring the one and only Daisy! When Daisy gets left with a babysitter for the first time, she fibs and says that she usually has ice-cream and chips for tea, never gets dirty, and always stays up watching videos till midnight. "Really?" asks Angela. "Really, really," fibs Daisy. But what will happen when Mom comes home? If you liked Eat Your Peas, you will really, really like this book! Kes Gray is the author of the award-winning Eat Your Peas and four more titles in the acclaimed Daisy series, as well as Our Twitchy and Who's Poorly Too?, illustrated by Mary McQuillan, and Billy's Bucket, illustrated by Garry Parsons. He also works as a freelance advertising copywriter. Nick Sharratt has written and illustrated many books for children. Pants, written by Giles Andreae, won the 2003 Children's Book Award, and The Hundred-Mile-An-Hour Dog by Jeremy Strong won it in 1997. He is the illustrator of all Jacqueline Wilson's prize-winning children's novels and his work appears in Playdays and Cosmopolitan.